All I got for Christmas was a digital refrigerator. My new Pandigital Novel, a little digital refrigerator. I’ve thus far resisted both the iPad and Kindle: iPad because I figured it would both improve and come down in price if I waited a little longer; Kindle because I figured I’d eventually go iPad, which would render it redundant. But my family just couldn’t bear to see me without another digital device in my paws. That goes for my wife, especially, who was sure my headaches were caused by reading the New York Times on my iPhone every morning in bed. So when my older son drew my name in the family Secret Santa sweepstakes, he and my wife conspired to fix the problem. Because the iPad’s price put it way over this year’s family Santa limit, and they thought I needed a little more breadth than the Kindle could offer, they settled on the Pandigital Novel, a moderately priced stepchild of the two. 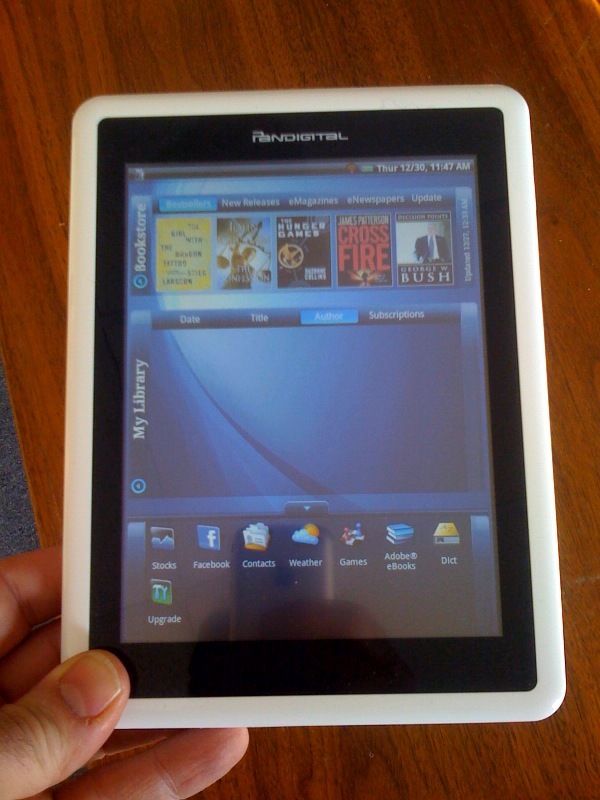 With the Kindle’s screen size and an Android OS, the PN offers a backlit color display, with email, Internet and access to Barnes & Nobles’ Nook Books. It’s an eReader with greater aspirations. There are lots of reasons to like the PN, as well as yearn for the Kindle (lighter and easier to read text) or iPad (bigger, user-friendlier, lots more functionality). Whatever, I’m grateful for the gift, which is now part of my daily life. But that’s not what this post is about. No, what this post is about is how I use my PN and what it says about The Future. My iPhone is a phone with other goodies. My TV is a TV I can hook up to the Internet. My laptop is primarily a business machine (even if increasingly less primarily). But my PN is simply a portable content delivery device. I find myself moving seamlessly between email, internet and books, checking my blogs on Google Reader, browsing the B & N book store. The PN’s a little slow, compared to a laptop or iPad, and— most frustratingly — won’t run most online video formats, which leaves out YouTube, Hulu, Netflix, et al. Regardless, this little critter has quickly become the thing I drag around the house when I’m home, like Linus’ blanket. Let’s assume for a moment it did serve video (not such an odd notion; the iPad does). It would then contain just about all the content I needed on a daily/hourly/immediate basis. That, of course, is not news. But what’s interesting is how I begin to think about that content. Because it’s now all coming out of the same device, all the lines blur. TV, movies, books, email, YouTube, blogs, Facebook, music: it’s all stuff that comes out of the same little device. Think of content like food. Once upon a time, people gathered their food in all sorts of different places and stored it in various ways. Much greater distinctions were made between beef and pork, milk and meat, raw foods and cooked. Now we all go to the supermarket, pick up what we want and put it in the refrigerator. There aren’t so many mental distinctions between milk and meat, root vegetables and leafy greens. They’re all in the same box. When we want something to eat, we go to the fridge. Devices like the PN are like digital refrigerators. When we want some food for the brain, we can open it up and take our pick. The ramifications of this complete convergence of content make the current debates over who will “own” TV delivery or music delivery a sideshow. The real question is how long will it be before we see Digital Content Supermarkets, virtual Safeways where you can scan the aisles for the latest Grisham novel, this season of SVU, or whatever else your brain desires. How much power will those Digital Content Supermarkets wield? Who will lead the way? Amazon? Netflix? Apple? A Player to Be Named Later? Will subscription services, like uber cable companies or Netflix be the wave of the future? Parochially I wonder, what will that mean for advertising? For brands? Aaaaugh, it makes my brain hurt! Must go to my digital refrigerator and grab a cookie!